How long would you wait until a video game showed off its best idea? How much good would you enjoy in order to reach something great? Lost In Shadow demands six hours to get itself ready. Lost In Shadow is a Wii-only side-scrolling platforming game. You play as the shadow of a boy, running and climbing across a flat landscape of shadows that are cast by the columns and girders standing or floating in the foreground of what appears — initially — to be a merely decorative three dimensional world. You are at play on the shadows cast on the walls inside of a tower. The initial wonder of the game is witnessing how sunshine beaming past a forest of metal and brick structures can create, on the wall beyond, a sort of shadow-Super-Mario-land on which we can play a video game. Hours later, there is a wonderful twist. Fans of brain-tickling, but never brain-hurting puzzles and optical illusions would enjoy this game; as would those who might like a Super Mario Bros. or Limbo that obeys rules of shifting light and shadow — if such rules permitted shadows to have the rigid solidity of a jungle gym. Plus: Wii owners looking for a solid game on a console facing a quiet winter 2011. The core idea here of being able to climb across shadows is, perhaps, a more interesting fantasy that a video game can let us fulfill than that of fighting in a war or racing a car. Perhaps. Super Mario Bros. With Shadows? Yeah, at first that's what this game is. But it's using more of a quiet, spooky fantasy aesthetic than Mario's bouncy crayon mania. Fans of the beloved PlayStation 2 game Ico will recognize the aesthetic here. The boy whose shadow the player controls in Lost in Shadow is captured atop a 55-floor stone and metal castle. As his shadow, we climb across the shadows cast on the tower's walls and floors, which are mostly brightly-lit brick or unyielding iron. You're playing this game with control stick and buttons. It's traditional. For a while, we're running, jumping... though unlike Mario we get a sword to fight our shadowy enemies. But there's this "wonderful eureka" of a twist? There is, though it is strange that it takes so long to find it. I didn't even know of this twist before reaching it. It's not mentioned on the game's box nor in its manual. I thought Lost In Shadows was a climb-on-shadows game and that's it. In those first six hours you can use the Wii's pointer to move portions of the castle's beams and to re-position light sources, which alters the shadow landscape and therefore the terrain on which your shadowy hero can run. But that's not the twist. Well, don't make it take six hours to get to the twist in this review! The twist is not, as far as I'm concerned, a spoiler. It's a fundamental mechanic in the game that fills out the range of important actions possible in Lost in Shadow's world. 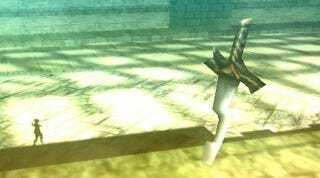 After passing many a mysteriously-glowing objects with which you can't interact, you find, in the game's sixth or seventh hour, a new sword that reveals those glowing things to be doorways. Stepping through these doorways turns your shadow hero into a three-dimensional being of light. More importantly, those doors lead out into the foreground of the game. 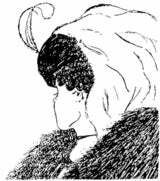 The famous old-lady/young-lady optical illusion referred to in this review. This is the game's great mind-bender: The seemingly decorative foreground that the player has spent six hours looking past or ignoring turns out to suddenly be relevant terrain. Ever see the old-lady/young-lady optical illusion? Gaining the doorway power in Lost in Shadow was similar to shifting from only seeing the old lady to suddenly realizing the young lady is there too. Each level immediately feels different. They pop. What was decoration is now crucial ground. The doorways to the front of the game world aren't everywhere, but they are frequent enough to make this twist a key element of the rest of the game. This twist is Lost In Shadow's essential experience. How's the quality of the game on either side of that great eureka? The game's platforming — all the jumping and running and manipulation of the environment needed to solve puzzles and advance further — is never tough. But there is a lot of it, and a lot of a not-tough thing makes the game feel long. You're not just climbing the 55-level tower, sorting out how to get through enough of their maze-like structure to collect three special items on most floors. You're eventually mandated to backtrack through them in the course of hitting a number of false finishes. What's odd is that the design of the levels feels so much more interesting near the game's final hours (I finished it in a little more than 16) that the simple early levels wind up feeling like filler. Super Mario Bros and lesser games have achieved Lost In Shadow's excellent late-game design complexity without requiring the player to go through so many kindergarten levels beforehand. Any missing features? The game doesn't need multiplayer, so that wasn't missed. But my little shadow guy sure could have used a block button or faster reaction time. Most of my deaths were from combat, which is odd given that the game's reason for being is not its combat. This game is thick with levels; plenty of content here. Any features you don't understand or just aren't sure why they're promoting? Sure! One of the four back-of-the-box bulletpoints promotes the idea that the game lets players: "Adventure with a spangle." To be clear, is this game similar to some of the other shadow games out there? I did expect the game to feel a lot more like Sony's Echochrome ii than it turned out to be. That Sony game has the player using the Wii-like Move controller as a pseudo-flashlight, "shining" light past a floating bundle of blocks so that they cast a shadow terrain on which a character can climb. The big difference is that, in Echochrome ii, you only control the light source (not the guy), a trick you do minimally in Lost in Shadow. If you're comparing shadow games, Lost in Shadow and Echochrome ii seem to have some sort of relation to unreleased indie game Shadow Physics. None of that diminishes the three games' appeal. Lost in Shadow is a surprisingly long and fairly easy game that lets us pretend we could climb shadows. I like that idea even when it is overly-stretched as it is in this game. But I love the idea that is added by the game's sixth-hour twist. Transitioning back and forth between the laws of a world made of shadows to the laws of the world on which those shadows are cast is a mind-bending delight. It's disappointing that such a wonderful idea is buried; it would be too bad if you missed it in this game or any other that eventually borrows from it. Lost in Shadow was developed and published by Hudson Soft for the Nintendo Wii, released on January 4. Retails for $39.99. A copy of the game was given to us by the publisher for reviewing purposes. Was sure the game was over multiple times before it actually ended; beefed my shadow up to a full 17.3 grams —- whatever that weighs — while finding/completing/collecting 87.5% of the game's stuff.